The teak outdoor 22 in. square paper recycling receptacle is built to withstand a lifetime of use. This receptacle is immune to rot because of the high oil content of teak. Tongue-and-groove construction features a 13.5 x 4 in. hole to accept white or mixed paper. Solid teak Pyramid 22 in. 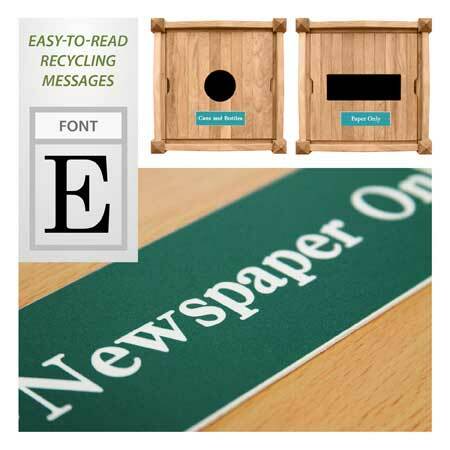 square paper recycling receptacle provides an elegant solution to the practical issue of recycling collection. Lid is fabricated with tongue-and-groove construction and features a 13.5 x 4 in. hole to accept white or mixed paper. Perfect for recycling programs, receptacle includes a custom-engraved plastic plaque. Maximum of 24 characters per line and 3 lines of text. Allow an additional 2 weeks for delivery.